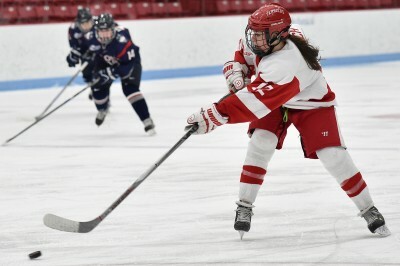 Relegated to the Beanpot consolation game for the fourth consecutive season, the Boston University women’s hockey team saw defeat snatched from the jaws of victory in its 5-3 loss to Harvard University Tuesday afternoon. Following a week-long hiatus in the wake of their 3-2 semifinal defeat to No. 6 Northeastern University, the Terriers (17-11-2, 14-4-2 Hockey East) didn’t show any signs of a loser’s hangover at the contest’s outset. They scored three goals in the first 10 minutes, due in large part to three points from junior center Maddie Elia. 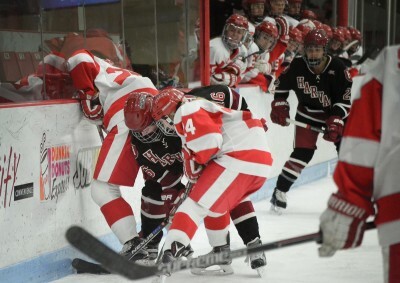 However, the Crimson (14-9-2) kept their foot on the gas pedal, scoring goals in all three periods. Their consistency culminated with four unanswered goals to close the game, including the go-ahead score late in the third period. For the second consecutive week, BU fell victim to a phantom goal. On Feb. 2 against the Huskies (25-5-1, 19-2 Hockey East) the Terriers had a potential score erased with an early whistle, which proved crucial in a one-goal affair. History repeated itself Tuesday when sophomore center Victoria Bach had her initial breakaway attempt snuffed out by Harvard goaltender Emerance Maschmeyer but tapped in her own rebound after a brief stoppage near the crease. Once again, however, the referees preemptively blew the play dead without the possibility for a review. A goal call would have put the Terriers up 4-2 with seven minutes left. Instead, the Crimson turned around and tied the game shortly thereafter via a rip off the stick of left wing Sydney Daniels. Daniels went on to score the go-ahead tally with just under a minute remaining in the third period, and senior Miye D’Oench iced the contest with a last-second empty-netter, making the final score 5-3. Durocher emphasized the importance of the two-goal swing created by the late no-goal call. Elia took matters into her own hands early when she generated a turnover in BU’s offensive zone one minute into the contest. She opened up a path to the net and beat Maschmeyer for the unassisted score and a 1-0 Terrier lead. Less than three minutes later, she potted another past Maschmeyer’s stick side for her second goal. After a wrist shot from D’Oench cut the Terrier lead to one with just over 15 minutes remaining in the initial frame, BU took advantage of Harvard miscues to extend its advantage once again. With eight seconds remaining on a man advantage, freshman winger Sammy Davis sent home another goal in her rookie campaign with some help from Elia and senior defenseman Lillian Ribeirinha-Braga. The score gave BU a 3-1 lead heading into the first intermission. The Crimson cut the deficit back to one once again midway through the second period when defenseman Briana Mastel beat junior goaltender Victoria Hanson for her third goal of the season. Despite holding a lead well into the final frame, Durocher could see signs of a comeback brewing after the first intermission. He said many of his players were worn out after a second period in which they took three penalties. And while they had a week to prepare, he noted that Harvard performed exceptionally well on short rest.